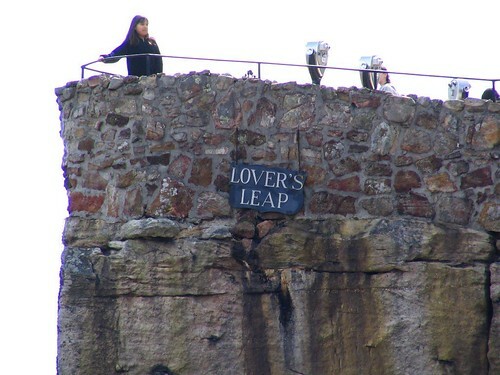 If you're at Rock City, this is perhaps the most famous spot. It's the observation deck where they claim you can see seven states. 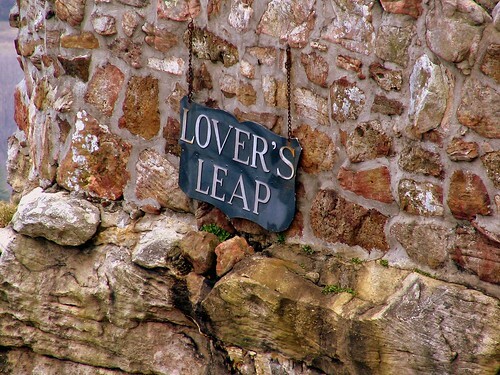 However, this is on the outside of the observation deck! When you walk the enchanted trail, you can get this view (zoomed in, of course) on the lead up to the famous spot. 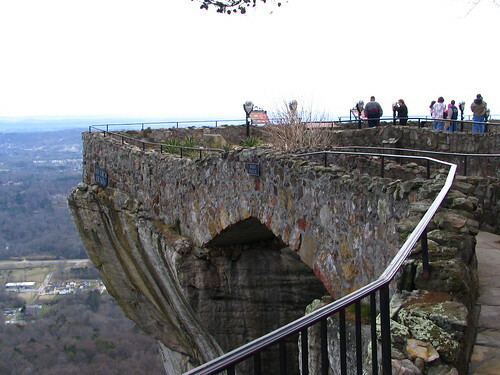 When the Carter family first invited people onto their property to see the amazing view, people just walked up to the edge (if they wanted to, that is). I suppose not too long after it opened commercially, they added the stone and mortar guardrail along with a paved walkway. (Imagine where the lady is standing without it!) Decades after that, the metal rail was added. (my guess is that doesn't actually make you safer, but people probably feel safer with it. 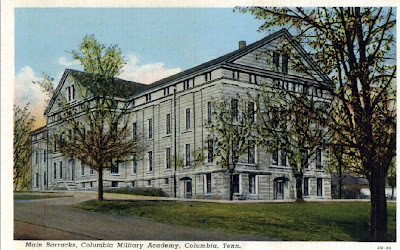 Has been "Columbia Academy" since 1979. Located at the important location of 7th St. (U.S. 412) at the train tracks. On the National Register of Historic Places, built in a Colonial Revival and Romanesque style. 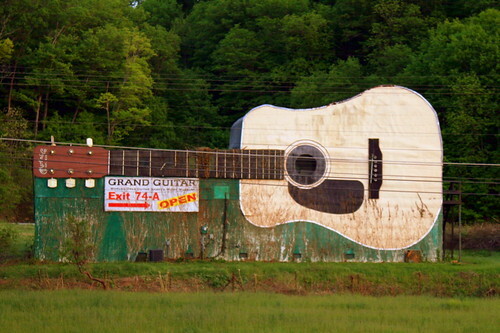 Clark Byers is the man who painted all the Rock City Barns back in their heydey. After he retired from Rock City, his next venture was to turn Sequoyah Caverns into a tourist stop. Naturally, there were barns advertising the Caverns, too. Clark Byers lived in this area, and the stretch of US11 through DeKalb County, AL already had several barns he'd painted. 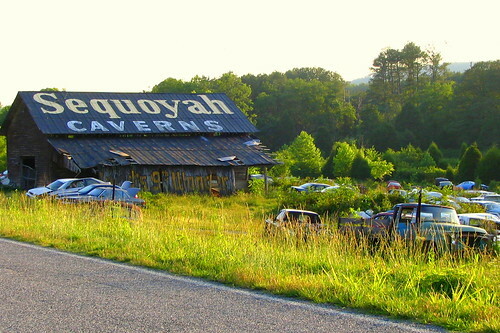 The roof is painted with "Sequoyah Caverns." Then, the next part of the roof looks like it was a later addition. (I don't think there's any message on the lower part of the roof.) The added overhang might obscure more of the message, but still visible is the lowest part "World's 9th Wonder." 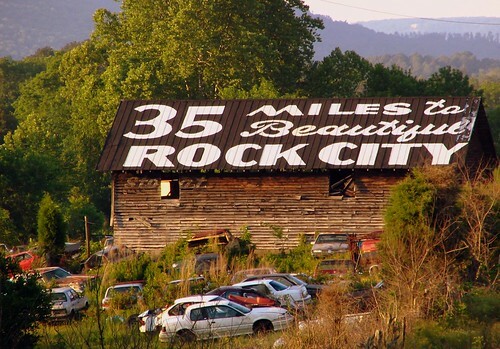 Presumably, Rock City is the World's 8th Wonder. 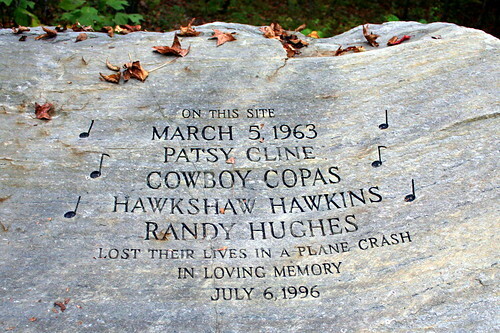 On March 5, 1963, the plane carrying Patsy Cline, Cowboy Copas, Hawkshaw Hawkins and Randy Hughes on their way back to Nashville ran into bad weather, crashing into a secluded area. There were no survivors. Decades later, if you now travel US641 through Camden, TN, a large green sign has been put up pointing the way. To get there, you have to follow Mt. Carmel Rd. West out of Camden, as you pass a residential neighborhood, an industrial area, and then finally make it into the rural woods. After a couple of miles down this drive, another sign points the way; it's a turn down a short gravel drive. From there, it's pretty simple - a small wooden entrance marks the start of a gravel trail down to the bottom of the small ravine. About half of the way there is a small booth with photocopies of the newspaper stories recounting the tragic event. As the gravel path goes a bit further, there are two more things to see at the end of the walk. I don't know how long this area has been open to the public, but there's a large stone etched simply with the date, the names, the event and a few music notes, as if to remind us that this was another day the music died. 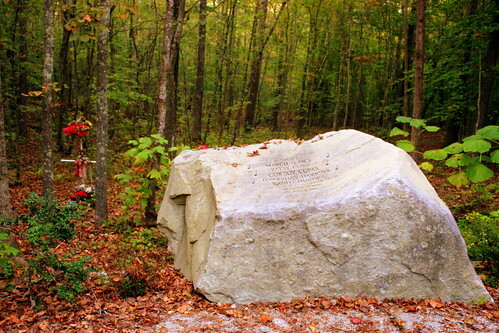 This stone was placed in June of 1996. While the gravel stops at the stone, something else is hiding behind the trees. While you can see it in my picture, it might be different on the day you chhose to go. A group of rocks have been formed into a pile to serve as a cairn for Mrs. Cline. Different momentos have been left by the adoring fans as the complete their journey, and when you go, there's likely to be different items that what can be seen on this day. 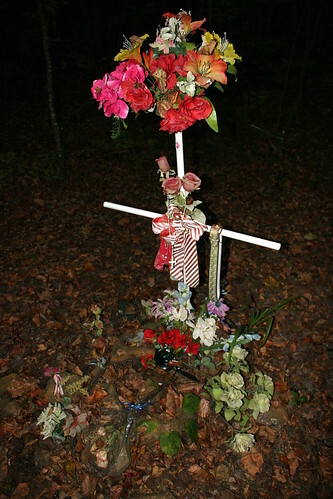 Haning from a cross (which I didn't see in older pictures) are some prayer beads, a bandana and a belt and all of it's covered in flowers. This is a congregation that dates back to 1881. 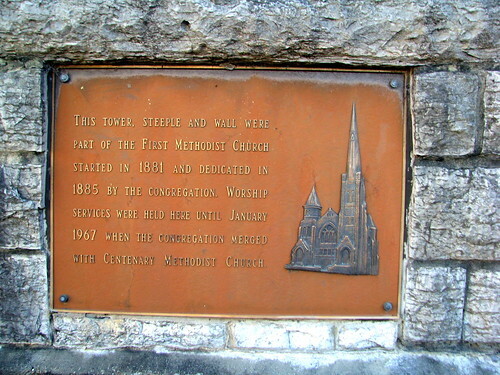 In 1967, they merged with Centenary Methodist Church. At some point, the rest of the church building was torn down, so now all that remains is the tall steeple and part of the wall. The plaque below is embedded in that wall. Maybe there was an airplane flying overhead. 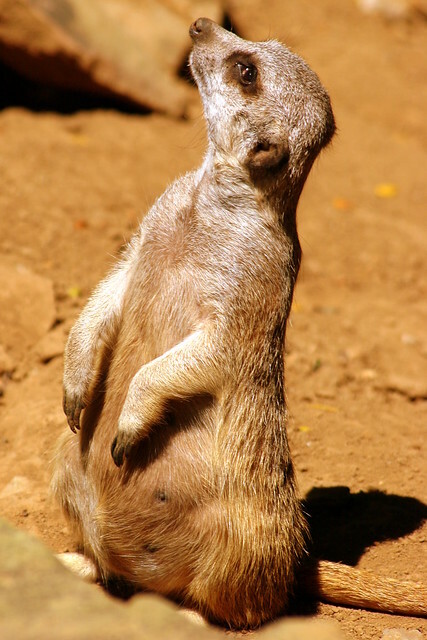 Meerkats seem to be fascinated by airplanes. I like the meerkats at the Nashville Zoo at Grassmere. There's several of them, and they stand still enough to pose for pictures. 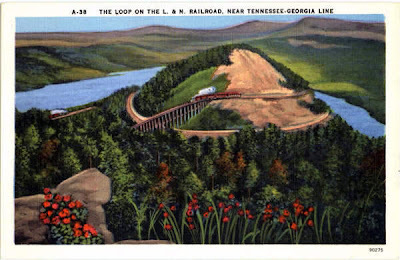 When L&N decided to build a line from Marietta, Ga to Etowah, TN, they experienced some geographical challenges on what became known as the Hook and Eye Line. The route from Farmer to Copperhill was particularly hilly and it resulted in what is depicted in this post card, the Hiawasee Loop, or "The Eye." Railroads can not have more than about a 1.5% grade, and to make it north of Farmer, the engineers determined the best way about it was a trestle leading to Bald Mountain, then a counter-clockwise loop around the mountain almost twice until it reached a low enough altitude to travel alongside the Hiawasee River southwest to Copperhill. L&N eventually became part of CSX and they continued to use this loop until 2001 when they abandoned the track. The area is inaccessible by car or pretty much any means other than train. The good news is the Tennessee valley Railway has an excursion train that goes through the loop on occasion. Farmer and the loop are both in Polk County, which is the Southeastern-most county in the state. The loop is literally 500 feet from the North Carolina border. Presidents Day was set to be celebrated on the third Monday of February as it falls close to President George Washington's birthday. Thinking of our nation's first president reminded me of this cake which showed up four years ago (the last year we had a presidential election) at the Tennessee State Fair. 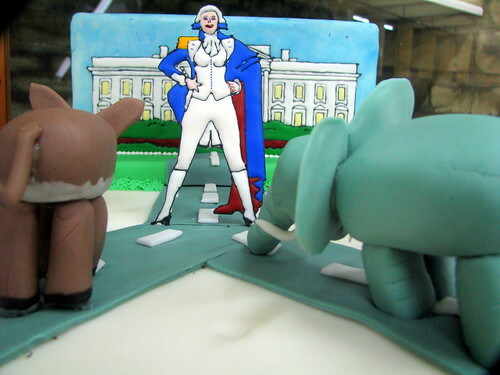 We will all probably see a lot of donkeys and elephants this year, albeit not in cake form. 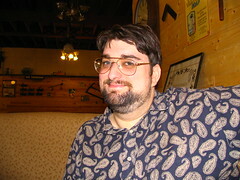 This is one of my all-time most viewed photos, as it was linked to by the immensely popular blog Cake Wrecks. It wasn't actually shown on the blog, as it's not fully a wreck, but since it got honorable mention in a political cake discussion, they linked to the photo and over 10,000 people took the time to click on the link. 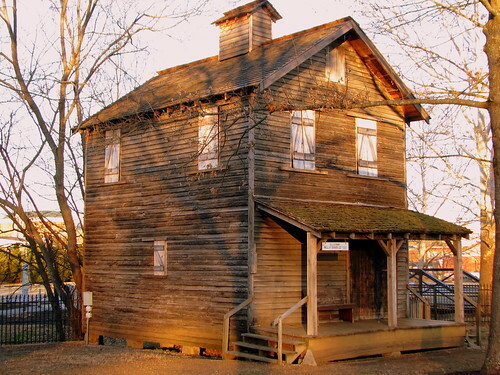 This is the Ellis Gray Mill and Grain Co. mill which was built circa 1830. 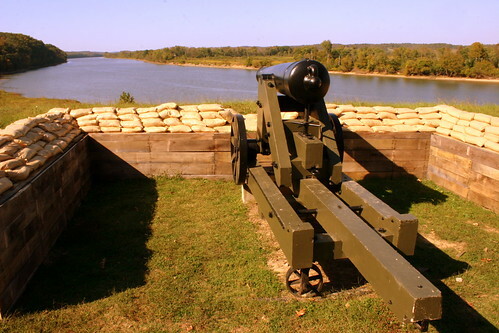 It has been moved and preserved at Cannonsburgh Village in Murfreesboro, TN. The village was started in the late 70's and the mill was probably relocated here then. The Ellis Gray company stayed in business until at least the late 50s. 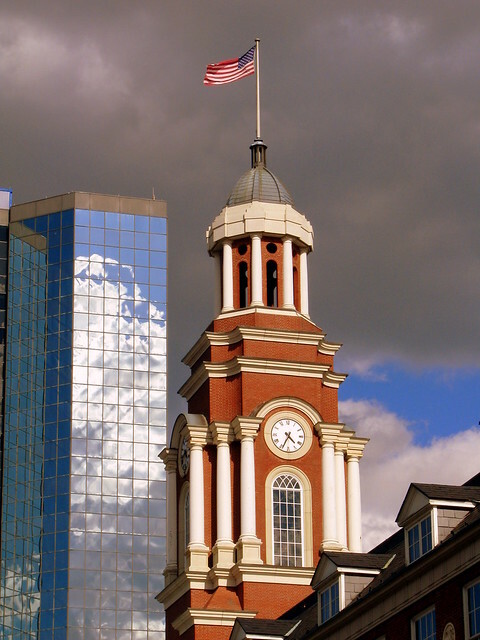 This building started out planned to be the corporate headquarters for Whittle Communications in downtown Knoxville. This company was best known for 40 magazines and Channel One for schools. The two block wide building was worked on for four years and about $55 million, when the company fell apart. Soon after the building became vacant, the federal government began looking for a location for a new federal courthouse. Acquiring this building was convenient for their needs. They were able to acquire the almost completed building for $22 million. Plus, it was conveniently located to the historic Knox County Courthouse across the street and the newer city-county building. All they had to do was retrofit some courtrooms into the building and by 1998, the Baker Courthouse was ready. 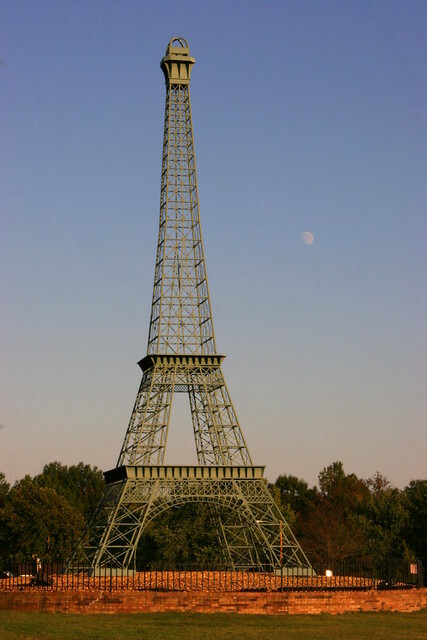 Paris, TN might be known for two things by casual visitors: The wordls largest catfish fish fry, and having a replica Eiffel tower. If you are travelling on Highway US 79 or US 641, look for the small sign on Memorial drive which will point the way. 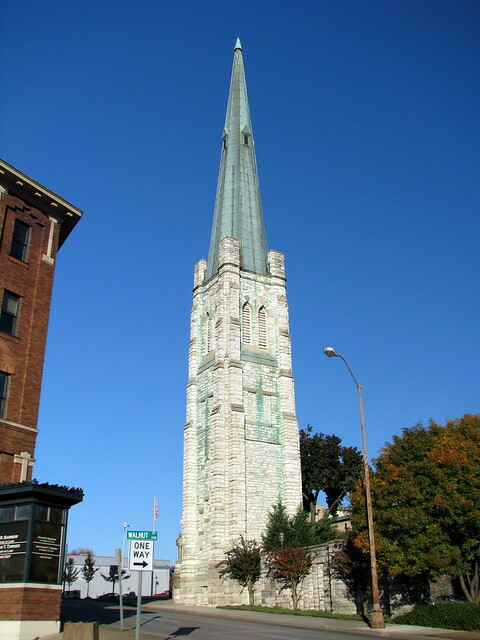 This 1:20 scaled tower was built by students at Christian Brothers University and given to the city in 1992. 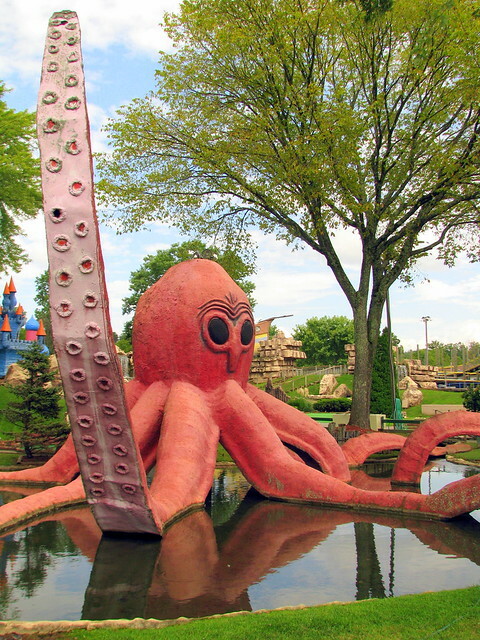 Engineering students built the 60 foot replica in 1990 for the yearly Memphis in May festival which was highlighting France that year. When it was built in 1930, this 203 ft tall building was the tallest building in Knoxville for about a third off a century. (Now it's the 5th talest.) It was the premier hotel until it closed in the 1960's. Today, it is called the Andrew Johnson Building and houses county government offices. 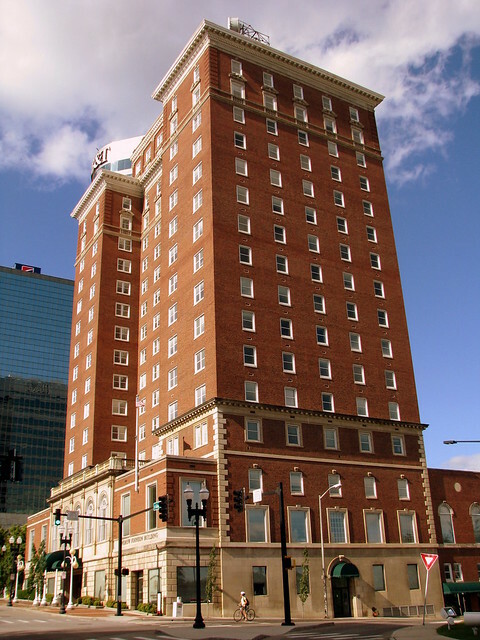 For many years, the 17th floor was the broadcasting studio and offices for WNOX radio, a station which was an early pioneer for country music. Country Music star Hank Williams spent the last night of his life in this hotel and died on the road the next day. This spot is strategically placed where you can see it from the Interstate, I-81 from a rest area, near the TN/VA border in Bristol. The street running along the other side is US11W. 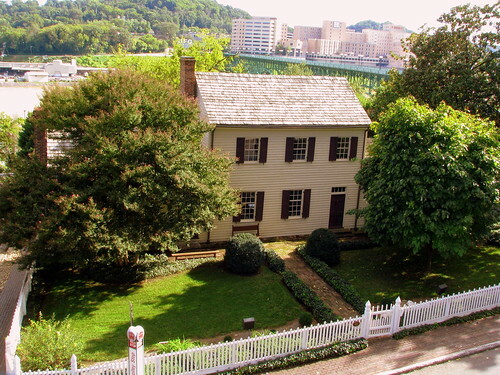 The Blount Mansion in Downtown Knoxville was the home of one the areas earliest leaders and the house is one of the oldest in the state. Blount was a signer of the United States Constitution, the only governor of the Southwest Territory, the olny US Senator expelled from the senate for treason (excluding the Civil War) and an early important politician in Tennessee. 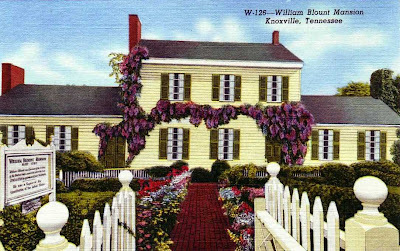 Blount moved to the area now known as Knoxville in 1792 and built his house overlooking the Tennessee River. 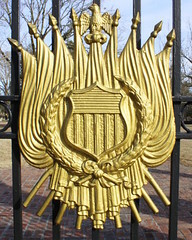 When the house was completed in 1796 it became the de facto capitol of the Southwest Territory. The mansion was built at a time when all the other homes in the area were essentially log cabins. Then as a new state was ready to form, the Tennessee Constitution was drafted in the house. By the 1920's, the house had deteriorated, and there were plans to demolish the house and turn this land into a parking lot. 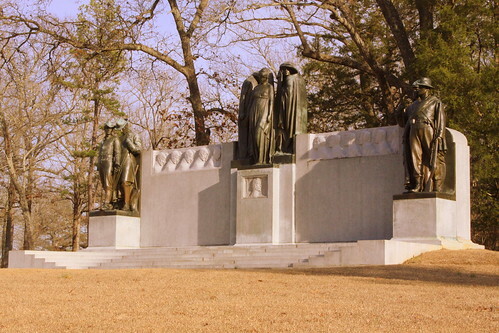 This was despite well-known Tennessee historian John Trotwood Moore calling the house the most important historical spot in Tennessee. By 1930, D.A.R. and the East Tennessee Historical Society had enough money raised to purchase and restore the house. This is one of the most photographed barn in the entire state, and there's a couple of reasons for that. First of all, it's photogenic, with it's nice maintained red color and tiered multi-story shape. Also, it's along the walk to Rutledge Falls, a place where many people bring their camera anyway. Rutledge Falls is on Private Property, but the owners are nice enough to provide a small parking area, plus a walkway between their barn and their home that leads to the falls. This is in Coffee County, just outside Tullahoma. Today is Abraham Lincoln's birthday. 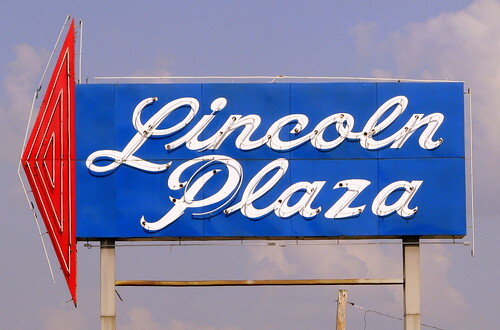 Lincoln Plaza, however was not named after our president. Fayetteville is in Lincoln County, named after Benjamin Lincoln, which was established 4 or 5 decades before Abraham Lincoln became president. This plaza is seen on US64 on the west side of town. 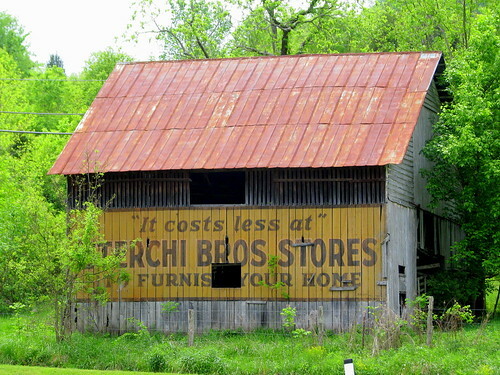 Sterchis barns are a real dying breed of advertising barns. The company is long out of business and their old warehouse in Knoxville is now turned into lofts. Who knows how many barns they ever painted. This is the 4th one I've found and they all coud lbe be 80 years old. at their height, they were the largest furniture chain in America. SSGT Ayers was killed in WWII on this day in 1945, and there is a monument to him in front of the Overton County Courthouse in Livingston, TN. Avers Kaserne is named in honor of this soldies from Company B22 infantry, United States Army who was killed in action on 10 February 1945 at Prum Germany. He was Posthumously awarded the distinguished service cross for extraordinary heroism in action in the defense of his country. 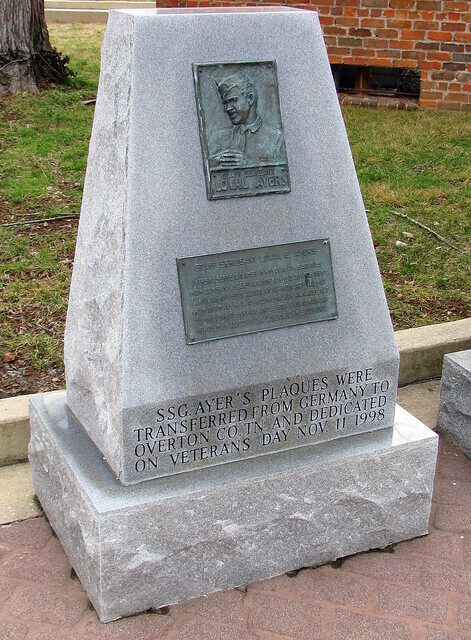 SSG Ayer's Plaques were transferred from Germany to Overton Co. TN and dedicated on Veterans Day Nov.11, 1998. 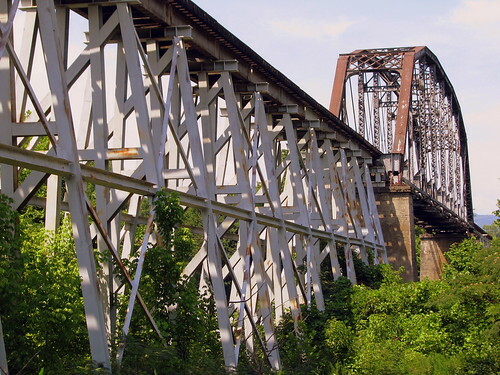 This Warren Camelback Truss bridge was built by L&N in 1910 over the Emory River in Harriman, TN. Today, the bridge is in use so that CSX can deliver coal cars to the TVA Kingston Steam Plant via trackage rights with NS. The main span is 23 feet long, although there is a lengthy approach on both sides. The bridge also parallels highway US27 across the river. There are plenty of jokes available here to go around. I'll let other people make them. 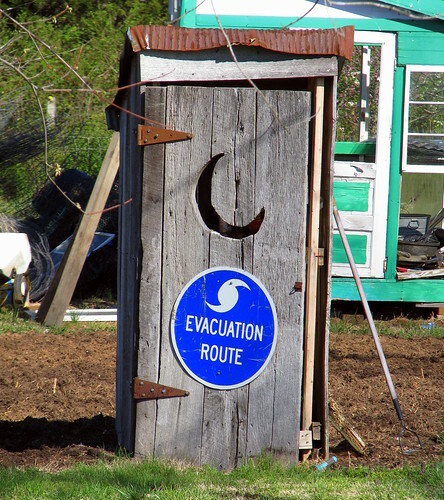 Seen in Leanna, TN, a small rural community in Rutherford County. These days, if you're driving from Nashville to Murfreesboro, you probably take Interstate 24. Before the Interstate, people would take Murfreesboro Rd. through Antioch, Lavergne, in Smyrna it becomes Lowry St. and then in Murfreesboro, it becomes Broad St. For a while, this stretch of highway 41/70S was also known as the "New Nashville Highway." Long before that was what we now know as the Old Nashville Highway, but well over a century ago, it was a turnpike. If you've never driven this road before, it splits from the newer highway in Lavergne and passes some out of the way businesses. In Smyrna, it becomes a well traveled road, but south of there it becomes quite a scenic route. There's a lot of farmland through the area, a couple of old mansions, a new Laotian Buddhist temple, a rock quarry, the entrance to the Stones River battlefield and eventually College St. in Murfreesboro. 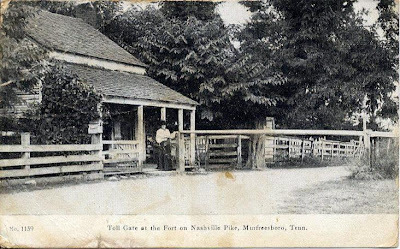 The road dates back to the 1830's when toll roads were built to connect the biggest cities and this road started out as the Nashville, Murfreesboro and Shelbyville Turnpike. Toll gates could be built every five miles, but not within a mile of the city, by state law. This post card dates to 1909, so it's probably about a mile north of the old city limits. 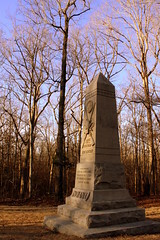 Archaeologists determined there was at one time a toll gate very close to the Hazen Monument at the Stones River Battlefield, and it was destroyed in the battle. This picture could have been taken very close to there. Tornados seem to hit Tennessee in the early part of the year. 4 years ago today, it hit one of Tennessee most important log buildings. 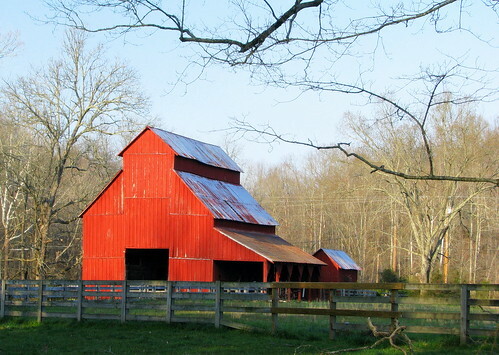 Wynnewood, located in Castalian Springs, Sumner County, Tennessee, is the largest existing log structure in Tennessee. 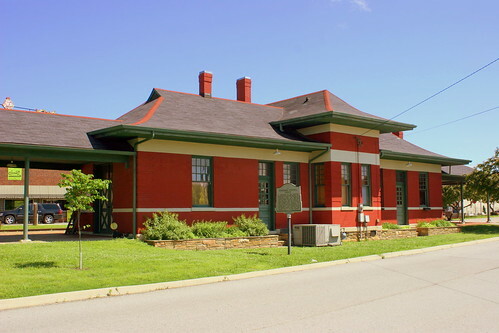 It was built in 1828 by A. R. Wynne, William Cage, and Stephen Roberts, to serve as a stagecoach inn for travelers between Nashville and Knoxville. In 1834, Wynne purchased his partners' shares in the property and moved into the inn with his family, where he resided until his death in 1893. 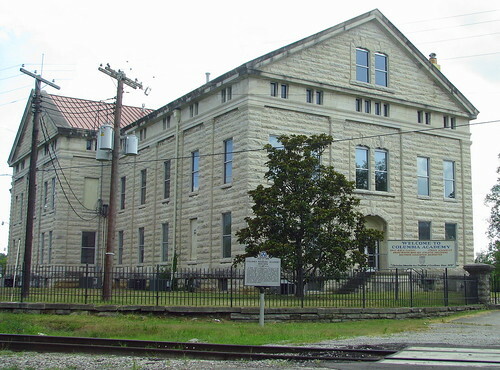 The building has since been placed on the National Register of Historic Places. It is open to the public and tours are available. 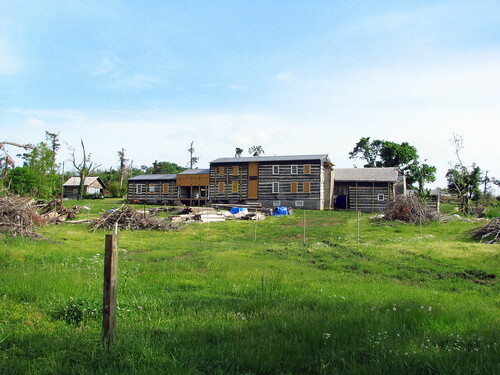 On February 5, 2008, during the February 2008 tornado outbreak, Wynnewood suffered major damage to parts of the second story, roof, and trees on the property. A.B. Cummings, Groceries, coal, Hay 8c. Trademark West Virginia Mail Pouch Tobacco for Chewing and Smoking. 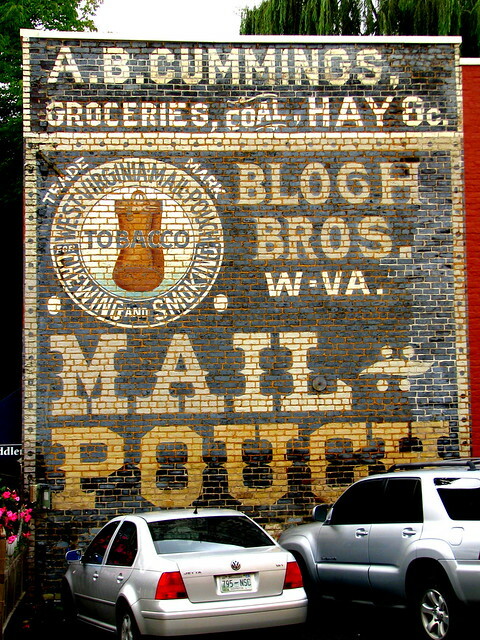 This ad is painted on the side of an 1889 building that was at one time a saloon, but today is a gift shop known as the Mail Pouch Building. Mail Pouch is much better known for their painted barns, but they have a few wall ads also. It's rare to see one as well preserved as this one. It was originally painted in 1902. Not too long after that, an adjacent building was built next door and the paint was kept from the elements for a few decades. 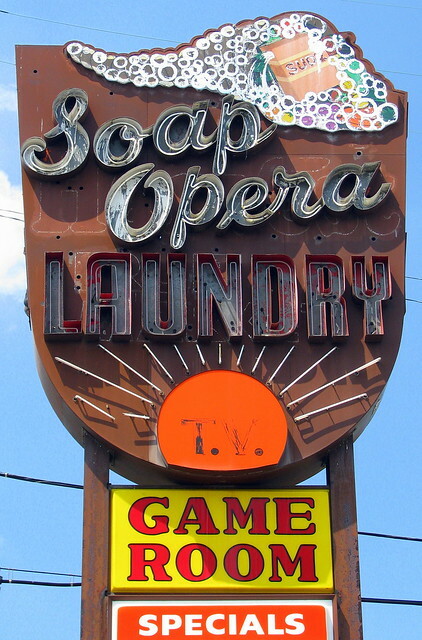 In the 60's, that building was torn down and this sign was rediscovered. Compare it to this one in Cookeville which may be just as old. 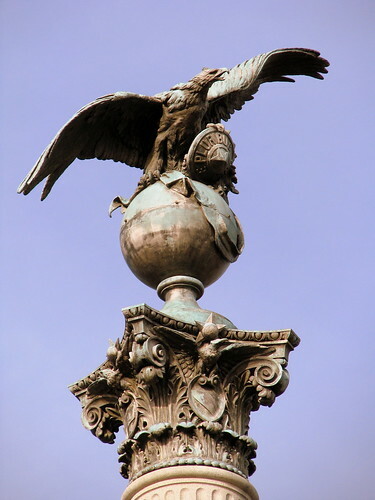 In 1820, Montgomery Bell created an Engineering masterpiece that is recognized today as an engineering landmark and a national historic landmark. 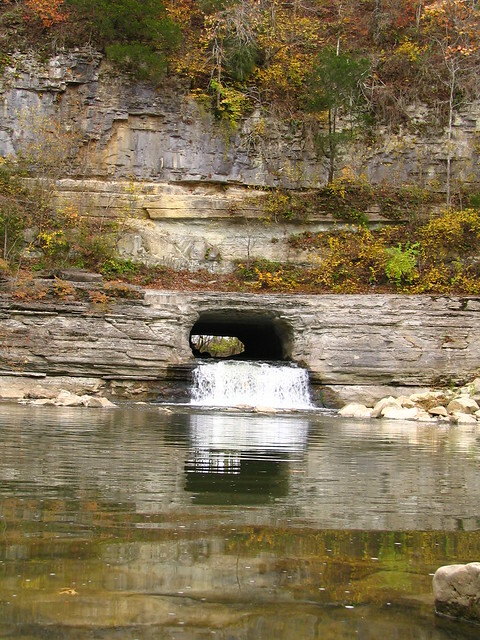 Slaves under Bell's direction excavated a 200 foot tunnel about 8 feet high and fifteen feet wide through a limestone bluff at a point on the river known as the "Narrows". It is here that the river makes a loop around a high limestone ridge before returning to within 200 feet of itself again. Bell knew that by diverting water through the tunel, the weight of the falling water from the plank flume would cause the water wheels to revolve on their axles. As the axles, made of large poplar logs, turned the protuding pins of white oak driven near the end of the log (called trip levers) would press down and then release a hammer lever. The hammer lever was a long log with a heavy piece of metal attached to its' end. The pounding motion converted the hot brittle pig ironbillets, which were held with tongs on top of a large anvil, into malleable iron bars and plates that were more manageable for blacksmiths to use in their forges. Each full revolution of the water wheel produced two heavy blows to the iron. Products of the forge were hauled by ox drawn wagons or pack mules through the Narrows Gap to markets in Nashville or Franklin or floated down the Harpeth and The Cumberland River to Clarksville where they could be shipped up or down the river by steamboat to other locations. Montgomery Bell owned and operated Pattison Forge, which bears his mother's maiden name, from 1832-1854. 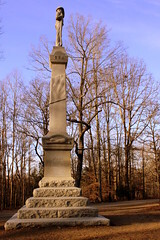 Afterwards, James L. Bell ran the operation until it was closed during the 1860's. 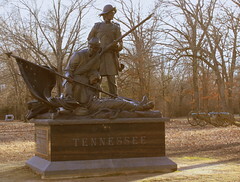 After the Civil War, the iron industry in Tennessee remained somewhat depressed, and the forge did not re-open. 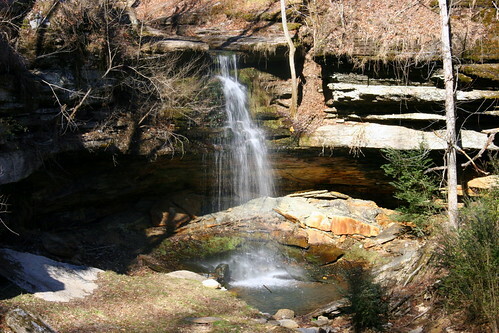 During the early 1880's the Narrows of the Harpeth was sold by the Bell descendants. In the years to follow, the tunnel furnished power to operate a saw mill, and later a gristmill, which was washed away during a flood in the mid 1890's. 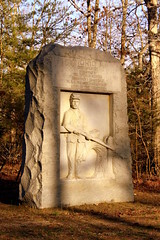 Today, the site of Pattison Forge, located at the Narrows of the Narpeth, is a part of the Harpeth River state Park and is maintained by the Tennessee Department of Environment and Conservation. 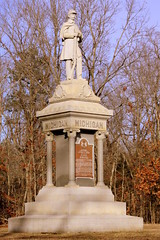 The site is also listed on the National Register of Historic Places. The intake side is just down a wooden staircase from the small parking area. The view above was made by walking the 10 minute trail from the parking area. 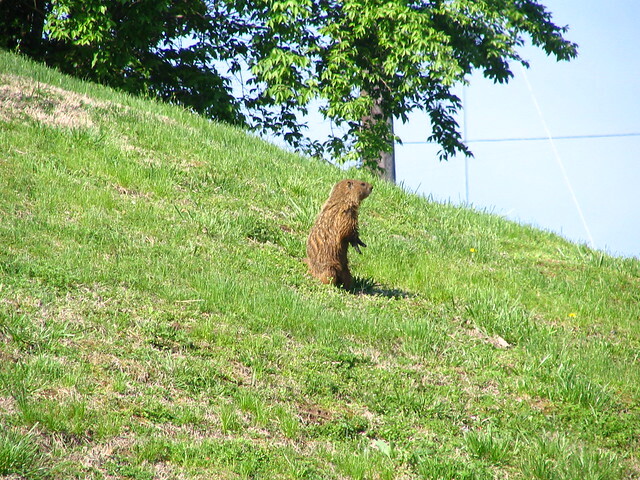 At least I think it's a ground hog. When I took this picture, the land was owned by the peterbilt semi-truck property at I-24 ahd Haywood Lane. He or She lived here for a couple of years, and I used to drive past this daily (as if the same day of my life repeated over and over or something). This is at the corner of Haywood Ln and Antioch Pk. Mary, why weren't you home when I came for our Rendezvous? Sorry, Steve, but I had to do the Laundry! It's Mike isn't it! You'd rather be with Mike that with me when I come over! No, Steve! I have some socks that needed washing! You've got to believe me! Is it obvious that I'm not good at writing Soap Opera dialogue?